When customizing the Infor CRM (Saleslogix) Mobile client, it’s common for the ApplicationModule to grow very large as more and more customizations get added into it. This makes the code difficult to work with and very poorly organized. There are some better solutions to keep your code nicely organized and easy to maintain. First of all, an ApplicationModule is a customization file that mixes in, or inherits, a base ApplicationModule class, allowing you to customize various parts of the mobile client without touching the actual files that make up those parts. See more about this topic on my previous post Adding Custom Fields to SalesLogix Mobile. For example, if you’re adding and removing fields on the ticket detail, edit, and list views, you’ll create an ApplicationModule to register the customizations on those views. If you’re using the SalesLogix Mobile Developer Toolkit, the creation of this ApplicationModule is the quick click of a button. Although it is common for the ApplicationModule to be named ApplicationModule.js, there’s no requirement that it is named that. If I wanted, I could create several ApplicationModule’s all within the same customization application (a customization application is your “argos-whatever” subfolder under the products folder). 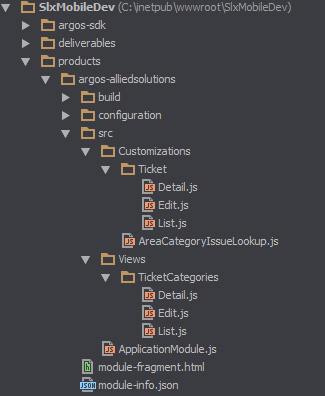 I could have a TicketApplicationModule.js, AccountApplicationModule.js, OpportunityApplicationModule.js, etc, and then add them all to the application development and production configuration files so they are all loaded into the customization application. While, that is much nicer than having all the ticket, account, and opportunity customizations all thrown into a single, huge, & messy ApplicationModule, it still can be too much code to have all together for my tastes. For example, If my ticket Edit view has a lot of customizations, I like that to be separate. Especially if the ticket Detail, List, etc also have a lot of customizations. It’s just too much code in the same file for me. It makes it harder to find things, harder to see what you’re working with. A common pattern to solve this is to create several functions, one for each view or area you’re customizing. You can see an example of this in the official sample customization application, argos-sample. There’s one ApplicationModule.js file with almost 600 lines of code. Each view that is being customized or extended has a separate function that contains the customizations for that view, registerAccountCustomizations, registerContactCustomizations, registerOpportunityCustomizations, and so on. That approach isn’t necessarily bad, it’s just too much code in a single file, not to mention there’s no separation of concerns. For me, I like to have things nicely organized, with code for each separate purpose being in a separate file. This is a smaller project and it saved my sanity. For larger projects, the benefits become more and more apparent. I should also mention, that if you’re separating your code into files like this, don’t forget you need to add each file to the release.jsb2 file when you add everything to Application Architect. The release.jsb2 file is what tells which files to combine into a single argos-customapp.js file. If a file isn’t listed, it won’t be added. Note, it is very important that you list the other files before your ApplicationModule.js (list your ApplicationModule last, after all other files in the release.jsb2 file), otherwise you’ll see 404 errors when the mobile portal loads. This way to organize your code might not be for everyone. For me even, it’s still a work in progress. All I know is that if I have to work with another ApplicationModule that has code for tickets, opportunities, and everything else all thrown together into a single, huge file, I might go postal. For the time being, this way keeps me, and my OCD, happy. Want Better Email Marketing from Within Infor CRM?